Rapsody is back just a year after dropping her debut album, The Idea of Beautiful, with a new mixtape titled She Got Game. The sixteen-track mixtape finds Rapsody taking her lyrics to another level and staking her claim as one of the game’s best emcee’s—male or female. She Got Game boasts guest appearances by Wale, Raekwon, Ab-Soul, Phonte, Jay Electronica, Mac Miller, and Common among others. The mixtape features production by DJ Premier, Denaun Porter, and 9th Wonder and the Soul Council. Rapsody spoke to The Real Hip-Hop about what it was like working with rap legends Common, DJ Premier, and Raekwon, the struggles she faces being a female emcee in a genre dominated by males, and her new mixtape, She Got Game. TRHH: What has the last year been like for you since The Idea of Beautiful dropped? Rapsody: It’s been a crazy year to say the least. A lot has happened in the last year as far as growth and expanding the fan base. I love The Idea of Beautiful but I told 9th I had no expectations for it. I just wanted people to like it and see the growth. For it to get the response via reviews that it got and the fact that people loved it, it landed me as a BET Music Matters artist and I got to perform on 106 & Park and all of these other things. It was great for me and then to put this piece of work together and be able to pull of the features that we pulled off—I’ve wanted to work with Jay Electronica forever and I never thought it would be this soon. I grew up listening to Common and I didn’t expect that to come this soon. It’s just been a really good year to say the least. TRHH: You have features from two of my favorite emcees on the mixtape, Raekwon and Common. What was it like working with them and how did you actually get Common because he don’t really jump on everybody’s stuff? Rapsody: No, he doesn’t. The Common thing was more so a lot of 9th’s help. 9th and Common have known each other for a while and they talk from time to time. I had that record and it just sounded like him to me. I even got the “Feels like love, love,” inspiration from him because it sounds like something along the lines of something he would do. 9th just reached out to him one day and sent him the song, Common heard it and said, yeah. Not to say it was that easy but that’s just what it was. I was blown away. He had a speaking engagement down here at North Carolina Central and I went to it. He gave a phenomenal speech and I went to meet him afterwards. He was very nice, humble, and a real genuine dude. He was like, “I got the record and I like it. I’m gonna do that for you. You got my word and when I give my word, I give my word.” That was one of the last records we were waiting for because he was shooting two movies during the summer. I met Raekwon two years ago for the first time. He had a show in Raleigh and after the show 9th got him and brought him to the studio. I was working on ‘Thank Her Now’ at the time. He looked at me and said, “You sing?” which most people ask when they don’t know me. I was like, “No, I rap,” and he asked to hear something. 9th played him a joint and he was like, “Wow, let’s do something.” The first song we ever did was ‘Black Diamond’ in 2011. He reached out to me later on and I did a record for one of his projects that hasn’t come out yet. We sent him another one because I wanted to work with him again. I love Raekwon like everyone else does. It was supposed to be on The Idea of Beautiful originally but with timing issues it didn’t work out so we just held on to it. He finished it and we put it on the tape. TRHH: Are you pleased with the response that you’re getting from the mixtape? Rapsody: Yeah. I’ve seen nothing but positive comments about it. People say they love it and I’m the first female that they’re album to listen to, which is crazy. I’m very pleased and overwhelmed. I’ve had talks with my peers about it and they love it. I’m extremely happy. A lot of people can see the growth and that I really locked in and worked hard on this one. TRHH: Your lyrics seem a little darker this time around. I detect a little bit of pisstivity [laughs]. Are you pissed off a little bit? Is that accurate? Rapsody: [Laughs] Yeah, that’s accurate to say the least. I got a lot of things out on this one frustration wise. Throughout this year there were small periods of me getting frustrated with the business. Besides everything good that happens there are still things that you get frustrated about. There are things that I go through being an artist that’s a female that make it a little harder for me than other artists. I think a lot of that is the frustration of that coming through. That’s why it starts out the way it does. It’s a story of me in my room and I’m depressed. There were days when I would get depressed about the business. It would frustrate me so bad but at the end of the day you gotta get up and keep going. If you don’t keep going you’ll never make it. You keep going and see the light at the end of the tunnel. It’s definitely like an “F.U.” moment ongoing for me [laughs]. I got a lot off my chest, even with the whole boxing me in as a female emcee like, “She’s dope for a female.” You’re pushed aside from everyone else that’s an artist and you’re in a special category. A lot of that came through in the project like, “Nah, I’m an emcee before I’m a female and I know I can rap with some of the best guys that are doing it now.” It was really getting everything out and not caring about anything and just doing me. TRHH: Is that the most frustrating part of the business for you? 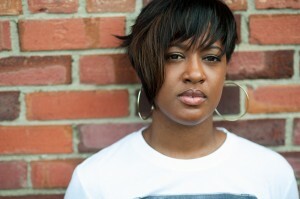 Rapsody: Yeah, that’s definitely been the most trying thing for me. People don’t even give you a chance. They already look at you and have these ideas of what it’s gonna be like. The bar is so low for you. It’s lower than other artists and they don’t expect you to perform at a certain level and they won’t invest in you for whatever reason. That’s definitely the most frustrating part for me. I don’t know if it’s how I grew up, I grew up around a lot of guys and it didn’t matter your gender if you were playing basketball or whatever. I always wanted to compete outside of my gender. I didn’t want it to be about gender. It’s definitely the most frustrating thing that I deal with. TRHH: You mentioned the Raekwon song earlier and last year when we spoke you said you had about fifteen songs waiting to be released. How many of the songs that didn’t make the Idea of Beautiful are on She Got Game? Rapsody: Only one and that was the Raekwon joint. I don’t think they’ll ever be released. For this project, outside of the stash that we have from Idea of Beautiful I probably recorded forty songs. We kept fifteen and the one from the Idea of Beautiful stash which was ‘Coconut Oil’. I have around twenty-five songs that I recorded that didn’t make the cut. We’re doing a deluxe version that’ll be out on iTunes. We’re going to add some of those songs that didn’t make it. I have a record with Blu that didn’t make it, a record with Styles P that didn’t make it, and a number of solo joints that I liked that didn’t make the DJ Drama version. TRHH: Why’d you title the mixtape She Got Game? Rapsody: Actually 9th came up with that title. Idea of Beautiful came out August 28 so I want to say this was around October or November and we were in the studio and he was like, “Yo, let’s do a mixtape called ‘She Got Game’. Nobody has ever played off that from a female perspective.” I was like, “I like it, let’s do it.” That was basically it. The concept of it is I can run with the guys. She has skills and she can play with the guys. It wasn’t too much thought into it. It was just an idea that popped into 9th’s head really quickly [laughs]. TRHH: DJ Premier kind of gave you something different from the usual Premier sound. Was that done on purpose? Rapsody: No, not at all. It wasn’t planned. He didn’t even make it for me. What happened was that was the last record I recorded and that was two weeks before the project was supposed to come out. I was in New York and I had an interview with Sway in the Morning. The first night we got up there we didn’t have anything planned and 9th was like, “What you wanna do?” I said, “Let’s see if DJ Premier is in town.” We usually go and talk to him and listen to beats and stories about Gang Starr—we just kick it and laugh. We go to see him and when we walked in the studio the beat was running and he was listening to it. 9th was like, “What is that?” and he said, “This is something that I made for Ludacris that he never used.” He asked me what I was doing up there and I told him I had an interview. He said, “You got another project coming out?” I said, “Yeah, in two weeks,” and he was like, “This is like three or four projects you’ve done that I’m not on!” I was like, “Well it’s whatever you wanna do DJ Premier!” I’ve been waiting forever to work with him and I never imagined it would play out like that. 9th was like, “We can take this one,” and Premier said, “Are you sure? It don’t really sound like me. It’s different.” That was it. We didn’t listen to anything else. We took that one. TRHH: The mixtape is not really a mixtape, it has the quality of an album. Why not just release it as your follow-up LP? Rapsody: That’s a good question. There was no concept behind it. It was just me in the studio mashing out songs and this is what it turned into. I didn’t want to sell it with all the features that I had. I just wanted to go in there and do something and not think about it and give it to the new fans. Originally the idea for She Got Game was because The Idea of Beautiful did well and I gained new fans I wanted to introduce them to some older things and sprinkle some new songs in it. It was supposed to be in the vein of Separate but Equal, the Gangsta Grillz that Little Brother had done. We already asked DJ Drama to do it for us and host it. I started recording these songs and the idea just got thrown away. We already locked in on the Gangsta Grillz idea so we wanted to stick with that because he has a different audience that wouldn’t necessarily touch with my music. So we just kept it like that and put it out. He’s always supported. TRHH: What does it mean to you to be performing at Rock the Bells this year? Rapsody: Ah man, that is nuts. That’s probably one of the most exciting things that’s happening this year. I did Paid Dues in 2012 before the album came out and that was crazy but to do Rock the Bells is a great thing to put on your resume. It’s a big festival with a lot of big artists and I’m excited about that. TRHH: What’s next up for Rapsody? Rapsody: Getting a tour together is in the works. Doing videos and doing everything we can to push this project. As far as releases go I’m in a group with Kooley High and we’re working on our next album. That’ll be out in the spring so the work doesn’t stop. I’m still in the booth recording right now for that. The majority of it is done. When I was working on the mixtape the guys got a head start and we’ve narrowed it down to a good twenty songs. It’s just me filling in the blanks for now. After that project is done I’m starting on my sophomore album, the follow-up to Idea of Beautiful. This entry was posted in interview and tagged 9th Wonder, DJ Drama, download, free, Gangsta Grillz, interview, Jamla Records, mixtape, Rapsody, Rock the Bells, She Got Game. Bookmark the permalink.